The awards announced by the Sundance Film Festival on Sunday included among the grand prizes the Syrian documentary Last Men in Aleppo, and the Cairo-set feature The Nile Hilton Incident. Last Men in Aleppo, directed by Feras Fayyad, won the Grand Jury Prize in the World Cinema Documentary section. Danish director and editor Steen Johannessen co-directed and edited the film, which is a co-production of Syria and Denmark. 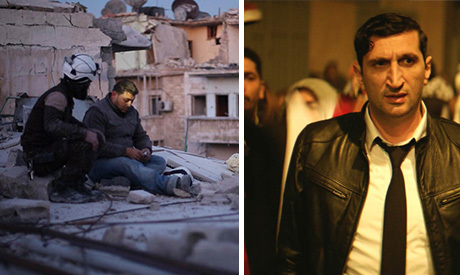 The feature film centers on two Syrians working with the rescuing organization the ‘White Helmets’ during the siege of Aleppo between the fall of 2015 and the fall of 2016. It focuses on the day to day labour of the characters placing humanity at the center, highlighting the importance of the White Helmets’ work, while they try to save lives from under the rubble, face physical danger, and tackle their own difficult existential thoughts. The Nile Hilton Incident won the Grand Jury Prize in the World Cinema Dramatic section of Sundance. The film is directed by the Swedish-born Egyptian writer, artist and filmmaker Tarik Saleh. The story is a fiction about a singer murdered in Cairo just weeks before the 2011 revolution, inspired by the true story of Lebanese Singer Suzanne Tamim’s murder in 2008. The Nile Hilton Incident is co produced by Denmark, Germany and the Sweden - based production company Atmo, which is co-founded by Saleh. “For many years, Tarik has been looking for stories in Egypt, his second homeland, which makes it very natural for him to shoot this film,” Atmo’s CEO and co-founder Kristina Aberg said in an interview with Variety.